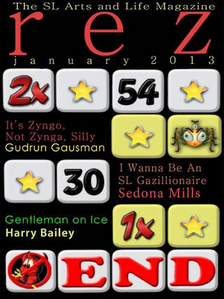 Zyngo gets the star treatment in the January 2013 issue of rez, with Gudrun Gausman teaching us about games of chance in SL and our prospects of winning, in her cover article, It's Zyngo, Not Zynga, Silly. Sedona Mills also discusses what it takes to get rich in SL in So You Wanna Be an SL Gazillionaire! When it comes to begging in SL, Flor Nachtigal gives her thoughts about the costs and benefits of getting something for nothing in The Business Model From Hell. The Perfect Gentleman, Harry Bailey, directs us to the finest winter sims in SL in Gentleman on Ice. The incomparable Crap Mariner brings us another piece of microfiction, A Lack of Art. Drover Mahogany gets inside our heads with a disturbing story of helplessness and lack of control in Encroaching.